English novelist Rose Tremain said, “Life is not a dress rehearsal.” I believe anyone who has ever raised children believed this early on. We felt as if we had one chance to get it right with this little, impressionable human who thrilled and terrified us all at once. I have one son, and I’ve heard parenting gets easier with the second born. I, however, am dealing with the teen years and can’t help thinking to myself, “Why would anyone do this twice?” I suppose it’s because most parents of two or more children have the successive offspring prior to the first reaching the teen years. I understand why some species eat their young. I’ll pay for his therapy when he’s an adult. Clearly Isaac was twelve years old or younger or twenty years old because if he’d been a teenager, it wouldn’t have been a sacrifice. So, yeah, I’ve been a little bumped and bruised during the parenting years, but at least the kiddo is none the worse for wear. Oh, he’ll tell you that his father and I have been put on earth with the express purpose of ruining his life (making him do chores, not allowing endless sessions of Minecraft), but little does he know this is true…oops, was that out loud? Compared to what his father and I endure, however, his woes are nothing because what life dishes out to us doesn’t always come from Josh, but it is in regards to Josh. 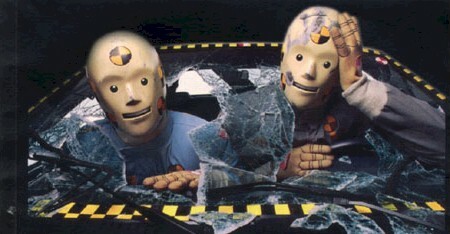 Parents get battered about like crash test dummies where their kids are concerned. For example, Josh recently obtained his temporary driver’s license and five days later, someone hit him. Yes, that’s right; someone caused an accident for our baby boy. I didn’t care that the car received damage; it was minimal. I knew the second after it occurred that Josh and I were fine. Also in his favor was the fact that he absolutely wasn’t at fault. And yet, I cannot shake this emotional tremor every time Josh drives. It has nothing whatsoever to do with his skill; he’s proving to be a remarkable driver. How do you convey to children what goes on inside your heart as they grow up and navigate life in general? Oh, that’s right; it comes when they have children of their own. I envision Joshua sitting in a car someday, probably exasperated because his son/daughter didn’t do the last chore requested of him/her, or he/she did it with an abundance of attitude. Then someone pulls out in front of him/her, and in a heartbeat Joshua throws his arm across his beloved child to shield them from whatever is coming. This actually happens quite a lot and not just in cars and not always physically. We have tender emotions and minds to guide and protect along the way as well. I love this annoying, sometimes smelly, often mouthy human to whom I gave birth. Yes, most days I want to pinch his head off like a dandelion, but just cross me one time where my kid is concerned and watch this crash test dummy transform into a mama bear. LOL, Mark – You sound like my mother. She’s threatening to do the same!